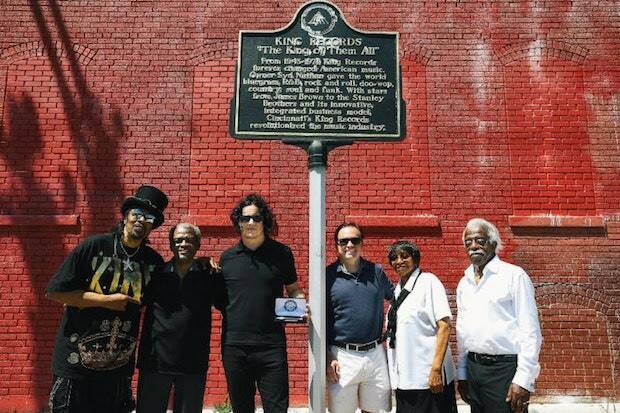 Jack White was awarded the key to the city of Cincinnati, Ohio. Mayor John Cranley presented White the key outside the building for King Records, home to James Brown, Bootsy Collins, Otis Williams, and more before the label folded in the ’70s. “Jack White has been an unfailing supporter of King Records,” Cranley said. “Jack has actually covered Little Willie John’s song, ‘I’m Shakin’,’ which on the original recording our own Philip Paul played the drums.” King artists Bootsy Collins, Otis Williams, and Philip Paul were also on-hand for the presentation. Check out a photo from the presentation below (courtesy of Big Hassle Media). Cincinnati recently acquired the King Records building property, saving the studio from demolition. City leaders are looking to restore the site, and the Cincinnati USA Music Heritage Foundation is also accepting tax-deductible donations to help fund the building’s revival.